A man holds up a sign protesting against a proposed coal-fired plant on Thailand's coast, in Bangkok, Thailand, Feb. 17, 2017. The Thai government has put on hold construction of the plant near the pristine beaches on the Andaman Sea. Thai environmental activists are calling for the military government to withdraw orders that currently place severe curbs on protests against industrial and development programs. Since taking power in May 2014, the National Council for Peace and Order (NCPO) has looked to tough legislation, including articles in the interim charter able to override all other laws and regulations. In 2016, Thai Prime Minister Prayut Chan-o-cha applied the laws from Article 44 of the charter to revise environmental regulations and allow infrastructure development to cover a wide range of sectors. 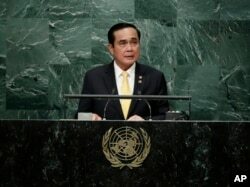 Thai Prime Minister Prayut Chan-o-cha speaks during the 71st session of the United Nations General Assembly, Sept. 21, 2016, at U.N. headquarters. These areas include construction of transportation systems, hospitals, irrigation systems and special economic zones for industrial development. The government orders override regulations governing town planning, ministerial regulations or laws set by local authorities, planning acts and local regulations. Environmentalists say the orders speed up the process for construction of controversial projects, but leave local people and the environment without protection. Suda Hemsanga, a Krabi resident, yells in protest against a proposed coal-fired plant on Thailand's coast, in Bangkok, Thailand, Feb. 17, 2017. The government's programs for development include the setting up of 10 special economic zones (SEZs) throughout the country, along the Thai border, to promote provincial growth and market access to neighboring countries. Other projects laid out under the fast development plans cover more than a dozen power plants, including coal-fired plants, as well as biomass and waste-to-energy plants. Since the military came to power, it has also invoked tough laws against protests and gatherings of people. Phil Robertson, deputy Asia director for Human Rights Watch, says the controls over protests further hinder people raising concerns over development programs. “The essential freedom of space that used to exist for community organizations and aggrieved community members to really stand up and make their views known has quickly shrunk, and it has direct impacts on people's ability to voice their grievances,” Robertson told VOA. Activists say they also are fearful of Thailand's tough defamation and computer crime laws that have been taken up by the private sector against local protests to development projects. Pianporn Deetes, Thailand/Myanmar director for environmental group International Rivers, says the laws and restrictions on assembly leave civic groups increasingly contained in raising environmental concerns. “Freedom of expression is one of the most fundamental freedoms that you need in order to participate in decision-making over natural resources, environment and social issues. This includes the policies on energy policy, coal-fired power plants, hydropower in every country or special economic zones," Pianporn said. The government also has directed its tough legislation against landowners encroaching in national parks in Thailand, especially resorts often owned by local influential business interests. Cholathit Suraswadi, director general of the Forest Department, said that since applying Article 44 laws in targeting forest encroachment and illegal logging, the area of forested land had been substantially increased. Dozens of holiday resorts throughout the country, including forested regions and island locations, have been investigated for illegal construction. Rights groups say in forested areas, however, local communities, largely poorer rural families, also have faced eviction under the government's programs. HRW's Robertson says the government's stand also reflects a rigid application of existing laws. “There is a change in environment in terms of land possession and things like that where this government is enforcing them much more seriously. And the local agreements that had been developed over a number of years, this modus operandi, that governance at the local level has been overturned, and what we're seeing is a throwback to a rigid interpretation of laws and regulations,” he said. By promoting Special Economic Zones and Economic Corridors, the government is looking to boost foreign investment, including offering longer leaseholds — to 99 years from the current 50 years, in some provinces. But Penchom Saetang, a director at the Ecological Alert and Recovery Thailand Foundation, says that with fewer checks on development going ahead, there will be greater impact on local communities. “The main concern is the rapid and aggressive development of industries and economy without consideration of the local people,” Penchom said. Despite the tough laws, though, local communities have continued protests against developments they see as harmful to their community. Protests from local people and the tourism industry against construction of a coal-fired power plant near the popular resort area of Krabi has led to a temporary halt of the development. Prime Minister Prayut ordered in April that the previous environmental health impact assessment be scrapped, ordering the state-owned Electricity Generating Authority of Thailand to conduct a new one, which would include greater input by local communities. Activists say there is need for a “green power development plan” for Krabi province, proposals that so far have received only a lukewarm response by state energy officials.